Pilot: Willard L. Oliver, Jr.
Oliver: Oliver couldn’t wear a parachute because he couldn’t fit into the bucket seats with it on. He was always fighting the weight limit. Dodson: Dodson was from Caw, Oklahoma. He was a happy country boy and nothing ever phased him except for one mission where the flak kept popping underneath the plane. Everytime the flak would pop, Dodson would jump. It was the only time we ever saw a reaction from him. Lawrence: Lawrence was a Flight Officer. This meant he could wear an officer’s uniform but he was not a commissioned officer. Hennings: As Flight Engineer, Hennings helped the pilot and co-pilot keep an eye on the gauges and he manned the upper gun turret. Queenie: The dog’s name was Queenie. It was a stray that one of the guys found on the base. I think we kept her and then gave her to another crew when we were finished. Before the crew became active, they were required to fly a practice mission in a tight formation around England. This was good practice to keep Nazi fighters away. 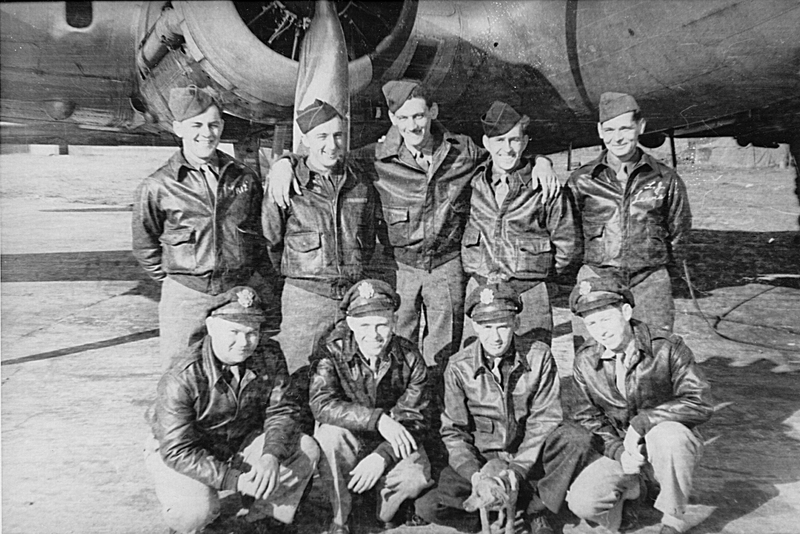 Dad met his crewmates in New Jersey after his own crew had been broken up. This crew needed a navigator because their navigator was sick. The first time he flew with them was to break in a plane that had a new engine. Dad and a few other crewmates were to fly it around for a few hours so Dad was provided only with a small map. The pilot, Oliver, got curious and wandered off the map so Dad did not know where they were. He told Oliver they were lost but Oliver wasn’t worried because he could use the radio compass to return to base. At one point, Dad looked out a window and saw a cable from a barrage balloon off the wingtip. He told Oliver who then weaved the plane to avoid the cables. When they were returning to base, Dad looked at the radio compass and it was spinning around because the base had turned the radio off at dusk. Oliver was still not worried as he had his own radio on a different frequency. They finally landed the plane after dark. Afterwards Dad was a bit concerned but later recognized that Oliver turned out to be a good pilot. He said nothing ever phased Oliver.